and dryer are provided for your laundry needs. and there are plenty of uncovered spaces available for visitors. Vacation Rental Amenities The condo is fully equipped with everything necessary for your vacation needs. There is cable TV, VCR, DVD and stereo system. Central air conditioning and heat. It is very centrally located for grocery stores, restaurants, shopping malls, museums etc and is close to freeways. Scottsdale and downtown Phoenix are only 15 minutes away. Would recommend condo. Thoroughly enjoyed our stay. We enjoyed our month stay at this gated condo very much. The location was close to Paradise Valley Mall with shopping, restaurants and cinema. Fast wifi with many TV channels and Showtime. Comfy king bed and very well-stocked kitchen. Large grassy area perfect for walking our dog. Owners were always quickly responsive. We especially enjoyed the fireplace and would highly recommend. Great second home for a month. We enjoyed our stay in this well stocked one bedroom condo. 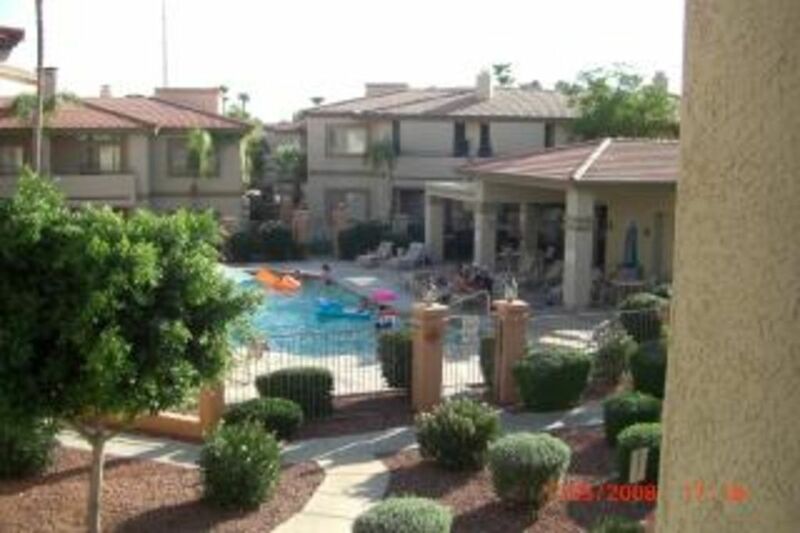 The location within the complex is great, just a short walk to the pool. Near to the complex is a variety of restaurants. Terry & Marcia want to be sure you are comfortable in their unit. My only suggestion would be to replace the bed pillows. They were too thin, but we were able to add a second pillow to give us a little more pillow fullness. There are plenty of dishes, pots and pans, towels, etc. They also provide great pool towels. We will definitely be staying there again. Loved it. Condo great, clean and had everything you could possibly need. As above. We enjoyed the condo. Nice quiet location and the complex was lovely. Would recommend to anyone and plan to re-book. We spent a month at this condo and really enjoyed our time there! For a one-bedroom unit, it was extremely spacious; our dinner guests loved the large kitchen, and we took advantage of that by cooking most every day. The condo is equipped with every cooking utensil you would need, and we even cooked a traditional Christmas turkey dinner with all the fixings! The king-sized bed was beyond comfortable, and there were plenty of sheets and extra pillows if needed. The ensuite bathroom was well stocked with high-quality towels and facecloths, especially the lovely lime green pool towels! Having a walk-in closet was an added bonus for both hanging our clothes and storing our suitcases. Terry and Marcia quickly responded to any inquiries we had both before and after we arrived. The check-in process was seamless, and the lock box was a phenomenal idea! We spent time at two of the complex’s three pools, and both of them were great. The complex is quite large and can be a little daunting, so we downloaded a map to our iPads, which was great in helping us get our bearings. We shopped at Fry’s for all of our grocery needs. Being Starbucks fans, we found two on opposite ends of 7th Street that we frequented every day. We were thrilled with the Heard Museum in downtown Phoenix and their gift shop’s lovely hand-made jewelry. We also visited the Phoenix Museum of Fine Art - Wednesday afternoons are free after 3 p.m. Frank Lloyd Wright’s home and teaching university in the Scottsdale mountains is a must see as well. The Desert Botanical Gardens had their annual light show, and we took that in a few days after we arrived. We hiked in Lake Pleasant Regional Park with our friends who were vacationing in Scottsdale, and the park has lovely areas where we enjoyed our picnic lunch. We took a day trip to Sedona, and even though it was quite cold the day we were there (38 F), we braved it to visit the church built into the rock. Sedona has the most breathtaking scenery we’ve ever experienced, as well as some of the most beautiful hand-made jewelry. For some retail therapy, we visited the three shopping outlets that were all within a 30-minute drive of the condo. Because there were no fitness facilities on site, we bought a month’s pass to Anytime Fitness, about a 5-minute drive from the condo. All in all, the condo has everything you could want for a stress-free, relaxing, safe, and secure vacation! residents. Horseback riding and other activities are also available. mountain bike trails, hiking available just minutes away. You can easily take a day trip to Sedona, Tucson and other cities. Phoenix itself, as with all major cities, has ample shopping, nightlife, and cultural events. Wheelchair accessible. No smoking in unit.